*Number of laboratories offering genetic testing services (GeneTests website http://www.genetests.org/laboratories/?region=can -accessed July 24, 2017). **Laboratories certified as a molecular genetic service centre by the CCMG (Canadian College of Medical Geneticists). ***The data about labs offering genetic testing services is from 2014. The data about labs certified in molecular genetics services is from 2008. Source: CICH graphic created using data adapted from Somerville MJ, Allingham-Hawkins DJ. Regulation of Genetic Testing/Service in Canada, In: Kristoffersson U, Schmidtke J, Cassiman J, editors. Quality issues in clinical genetic services. Dordrecht, Heidelberg, London, New York: Springer; 2012. p.87. For a list of the laboratories offering genetic services in Canada, view the Gene Tests website. http://www.genetests.org/laboratories/?region=can-accessed July 24, 2017. The administration of health care in Canada, which is provincially/territorially based, can create barriers to provinces/territories working cooperatively in the delivery of genetic testing.1 Many centres do not have the funding to adopt the latest technologies to conduct tests as quickly as patients and their families might need. 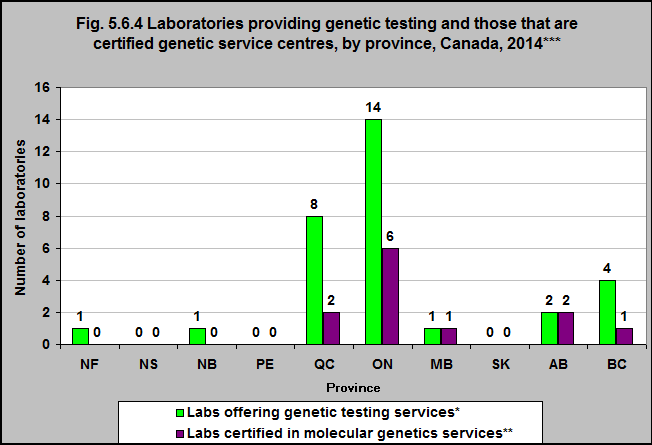 Further, the range of laboratory services available is not uniform across Canada. Many factors influence decisions about whether or not genetic screening and/or testing is offered. These include the prevalence of the condition in the population and the validity of the test. There are also ethical, legal, social, and cost factors to consider. It is often not easy to have rare diseases investigated.